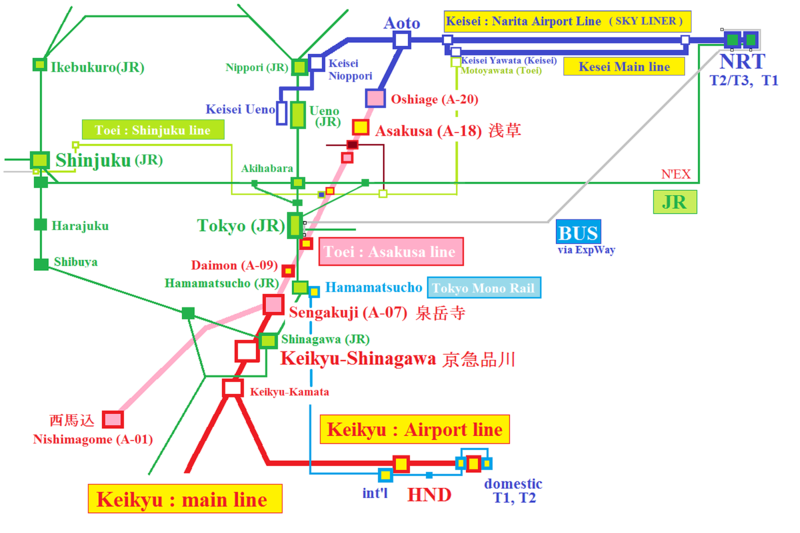 We recently took the Keikyu line from Haneda to Shinagawa with our Pasmo cards. Upon our arrival we went through gates / turnstiles (which charged our cards) that transferred us into the main platform area at the station... and that's where a lot of confusion ensued. We were really just trying to exit the station using the east side exit but we encountered another set of turnstiles that refused to take our card, so we had to ask the information desk and backtrack through the terminal to exit through the Keikyu line turnstiles and walk on the outside of gated area. So I understand that main issue... we entered into the main station where all the subway and JR east platforms are, instead of exiting the Keikyu line properly. But can you not exit the same station without going anywhere within a few minutes without incurring any charges? I mean, we had literally entered like 2 minutes through the Keikyu line gates before we tried to exit. There is a charge just for platform access. To prevent this happening again. Best to read the info signs above the fare gates. Thanks, but in that case shouldn't the gate have charged us whatever that fee was instead of saying "please inquire!"? No, IC cards cannot be used for that. The station turnstiles don’t know what to do if you enter and exit the same station. Which is really annoying when you’re going to a station just to eat at a particular restaurant. I’d gladly pay a shortest-distance fare for access, that’s seems fair to me (no pun intended ). But it makes you go to a counter and try to explain in a foreign language that you just wanted to eat at T’s Tan Tan. Well, I'd say it is only fair that the IC card doesn't charge you for the "transit" fee through the station. This way you need to go to the attendant and ask. He/She will tell you that you can either go back to the entrance from where you came (and then you don't pay) or that you will need to pay. So it is your choice. Otherwise I think a lot of people would complaint about the IC card getting charged for "nothing". BTW there is a very large sign above the exit from Keikyu Shinagawa into JR Shinagawa saying that this is not an exit. I understand you are new to Japan and were probably tired, but normally in Japan everything is quite well indicated, and even if you do it wrong (e.g. going through the wrong "exit") often safeguards exist that help you to rectify the problem. E.g. if you buy a paper ticket and don't pay the full fare. No problem in Japan, the destination station turnstills wont let you get out, but you can just pay the difference at a machine. No extra charge or any fine. Very unlike all other countries I have travelled/stayed in. There even if you have a ticket, but it is not valid for the entire travel, you are still treated like you hadn't bought a ticket at all. Enjoy your stay in Tokyo! @Gregalor That's what entrance tickets (入場券) are for; no need to go to a counter, you can buy them from ticket machines. The second map is "JR" only, but written in English. bottom is East exit(東口 higashi-guchi) called 港南口(Konan-guchi) also same. You had to KEIKYU ticket gate(京急高輪口) on the 1F out from arrival platform on the 2F. To go to the East exit again go up to the 2F and go through "free passage(自由通路)". but this method is not allowed because PASMO(IC card) causes an error. so in case you like, you can correct the error as soon as you explain to the gate staff. that PASMO can not enter and exit only for shortcut ticket gates at the same station. but in Shinagawa station case this is the right way to use. it means to add a new KEIKYU ticket gate directly connected to the 2F passage. so this old structure still remains, it is inconvenient for some passengers like you. there is no "subway(underground rail, 地下鉄 chikatetsu)" station at Shinagawa station. Fares are the same for any train, no worry and Toei 5500 series(都営5500形) is the newest. This is not a video recorded at Shinagawa, but you can see the brilliant of new cars. so it is very lucky to get on, but there is no guidance as to which company's car will come. so be careful of the destination(行先 ikisaki) of the train. and platfome will display Japanese and English alternately.